Jadestar, try moving your SpaceEngine folder to somewhere other than Program Files. You can also try running as administrator. I just tried both but both failed. I do have a question for you, Space Enginere or anyone else who knows though: Someone here suggested I try the latest AMD beta drivers (15 something) via the command line (i think?). However, everything I've ever read on this forum cautioned us AMD users from using the beta drivers and last I checked I think 14.12 or was it 14.4 was the preferred AMD driver for Space Engine. Also a more general question. What is the prefered way of uninstalling old drivers? I just follow the instructions from AMD but I've seen other people say that's not enough? I don't know a whole lot when it comes to uninstalling drivers, and with Nvidia just installing the new driver has always been good enough. So someone else will have to come along and answer that question. Unhandled exception: page fault on read access to 0x00000000 in 32-bit code (0x0054e685). serejafadeev, please upload your se.log file as described in the opening post. Jadestar, I have an AMD R9 270 (not x) that causes no problems. I use the drivers "15.201.1151.0", but SE was working (more or less) even with stock drivers. I don't think your problem is related with drivers, because if it was SE would run anyway but with artifacts, it seems like that's not the case here. I suggest you to try to install a Virtual Machine and try use SE there, that would show if there are some OS related problems. I have an issue with comet tails, the example for which is below. I normally just run SE without comet tails on but I wish I could. I run a laptop with Intel HD graphics, which are known to be pretty shocking with SE I believe. I resolved the issue with a neat little fix. While having a glance through the log, I noticed there are two sections referring to comets, "shaders/comet_tails.glsl" and "planets/comets.sc". It's the second one that was causing the issue. In the catalogs folder there are 2 *.pak files, "catalogs0973.pak" and "catalogsSE.pak". I opened both of those, and "planets/comets.sc" was only in "catalogsSE.pak", so I simply copied it into "catalogs0973.pak" and now I can finally see comet tails! I delved deep through every troubleshooting thread in search of this issue that I had and I found nobody else seems to have ever had this issue, which makes me think I may have had a bad download or something like that, I'm not sure. But there's my fix for my own issue in case I'm not the only one! Turns out it's not exactly a permanent fix, and it often reverts back to how the image looks. Also I feel like the editing of the files is the reason my Sol system has disappeared, leaving me to explore the procedural universe instead. I have just had Windows 7 Professional 64 bit installed on a Dell Precision T3500 with 21GB of RAM, W3530 Xeon 3GHz quad core processor, with an NVIDIA FX 4800 graphics card. I am using a 1028*768 screen mode. I am new to Windows 7 so I may not be familiar with all of the security/admin issues. I am pleased to report that running Space engine as administrator fixed the problem. Jesus guys!!! It is not very professional to fail to start with an exception and system error just because the program is not run by the administrator account. I thought I was running as an administrator just to add to my confusion. 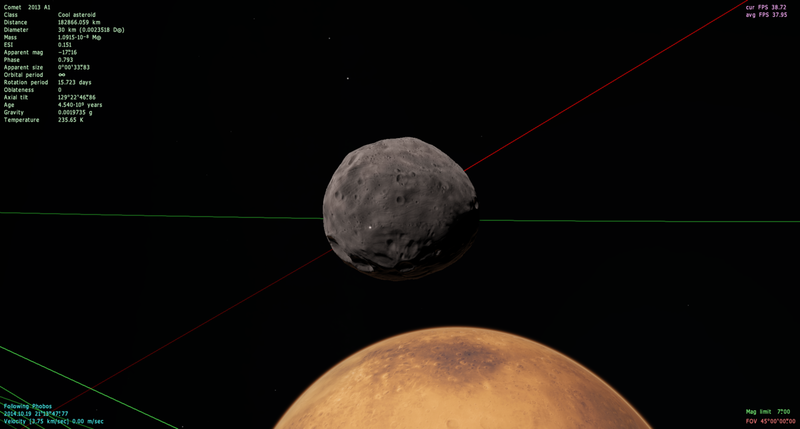 When there's a lot of objects in one screen, space engine will ether crash or my entire computer will CRASH AND RESTART. Can you make graphics settings more advanced? There are 4 problems on star-generating process. From data of [Shift+F3] browser, I guess that the stars are first generated by luminosity, then other properties. The first bug is the wrong mass-luminosity relation of main-sequence stars. In reality, L ~ M^2.3 for M below 0.43 M(sun), L ~ M^4 for M between 0.43 M(sun) and 2 M(sun), L ~ M^3.5 for M between 2 M(sun) and 20 M(sun), and L ~ M for M over 20 M(sun). In SE, I found that L/L(sun) = 0.23 * (M/M(sun))^2.3 for M below 0.43 M(sun), L/L(sun) = (M/M(sun))^4 for M between 0.43 M(sun) and 2 M(sun), and L/L(sun) = (M/M(sun))^3.5 for M between 2 M(sun) and 20 M(sun). The gap on 0.43 M(sun) is a small bug, e.g. And the gap on 2 M(sun) is a large bug, e.g. The latter one is really a problem! The second bug is that the temperature-radius-luminosity relationship breaks the Stefan-Boltzmann equation: L/L(sun) = (T/T(sun))^4 * (R/R(sun))^2 (where T(sun)=5778 K, not 5860 K in SE!). And the luminosity displayed is always lower than the calculated value by Stefan-Boltzmann equation. As a result, the sun in SE has radius 1.0659 R(sun) , and a generated star with M = M(sun) and L = L(sun) is a G5V and has radius 1.162 R(sun). What's more, this bug is extremely significant in O-type main-sequence stars - the displayed luminosity is only 0.011 times of the calculated value for an O3V star! The third bug is the confusing of bolometric luminosity and visual luminosity if we don't see bug 2 as a bug. It seems that the "luminosity" for mass-luminosity relation is bolometric luminosity (total energy emission), but the "luminosity" for temperature, radius and stellar class is visual luminosity (luminosity only on visual light). The fourth bug is that one type of stellar class has only one temperature. As a result, the sun, a G2V star, has temperature 5778 K, but in SE it has temperature 5860 K, because G2V has only one temperature: 5860 K.
The fifth bug is the wrong generating mode of binary stars. I guess that binary stars generate in this way. First a star generates as usual. Then this star has certain probablity to become a binary. If it becomes a binary, then its companion B "steals" A's luminosity, with the total luminosity stay the same. The problem is: A loses some luminosity but still has the same temperature and stellar class. For star system of over 2 stars, e.g. AA, AB, BA and BB, first the star generates, then B generates and A loses some luminosity. Then AB and BB generates, and both AA and BA lose some luminosity. Bug 3 may lead to those results. a. If we see "luminosity" as bolometric luminosity then it doesn't fit Stefan-Boltzmann equation. b. If we see "luminosity" as visual luminosity, then it doesn't fit mass-luminosity relation. c. Combine a and b we get: the radius, temperature and stellar class don't match the mass of a main-sequence star. In reality, L ~ M^2.3 for M below 0.43 M(sun), L ~ M^4 for M between 0.43 M(sun) and 2 M(sun), L ~ M^3.5 for M between 2 M(sun) and 20 M(sun), and L ~ M for M over 20 M(sun). In SE, I found that L/L(sun) = 0.23 * (M/M(sun))^2.3 for M below 0.43 M(sun), L/L(sun) = (M/M(sun))^4 for M between 0.43 M(sun) and 2 M(sun), and L/L(sun) = (M/M(sun))^3.5 for M between 2 M(sun) and 20 M(sun). I will change it to smoothed version near M = 2. The second bug is that the temperature-radius-luminosity relationship breaks the Stefan-Boltzmann equation: L/L(sun) = (T/T(sun))^4 * (R/R(sun))^2 (where T(sun)=5778 K, not 5860 K in SE!). SE uses the same data tables for stars as Celestia. In this tables, G2V star have effective temperature oа 5860 K. This value also used in SE as solar temperature constant for all equations. Vice versa. Yes, SE don't have bolometric and visual luminosity as separate parameters for stars, and compute bolometric correction instead. There is may be other confusions with it. Why you think this is bug? SE uses data tables to derive temperature, rotation period and other values for stars. This is why the same class have the same temeprature. The fifth bug is the wrong generating mode of binary stars. Why "wrong mode"? This is method I choose to ganarate multiple systems. In 99% cases secondary star have much less luminosity than primary, so change in primary luminosity is negligable. I use this method to save "average" speactral class of the whole system, so procufural bifurcation of catalog stars will not change their spectral class. Also, computing of the new spectral class of the star with lowered luminosty is a bit tricky and may give very incorrect result. Not enough disk space? I downloaded space engine yesterday and it said low disk space? And do you have low disk space? How much space is available? It sounds like you just need to free up some space on your hard drive.